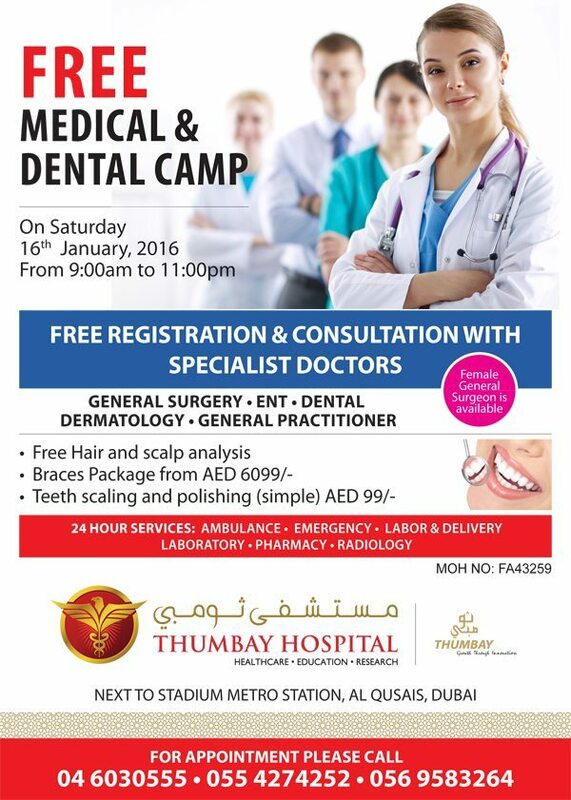 Thumbay Hospital Dubai, the leading academic hospital in Dubai owned and operated by Thumbay Group, will be conducting a free medical and dental camp from 9 am to 11 pm on Saturday, 16th January 2016. The camp aims to increase awareness and promote medical and dental health among the public. Free consultation would be available with specialists in General Surgery, ENT, Dentistry, Dermatology and General Medicine. The camp will also have free hair and scalp analyses, and all dental procedures will be offered at 20% discount. Visitors to the camp can also avail special discounts on braces package, teeth scaling and polishing, caloric vestibular test and pure tone audiometry (air, bone). “We regularly conduct many such camps as part of Thumbay Group’s corporate social responsibility. With these camps, we aim to help the public gain easy access to superior healthcare,” said Mr. Akbar Moideen Thumbay, Vice President of the Healthcare Division of Thumbay Group. “We always get overwhelming response for our health camps, and a lot of people across the UAE benefit from them,” he added. Thumbay Hospital is located next to Stadium Metro Station in Al Qusais, Dubai. A unique feature of the hospital is the 25-chair Dental Hospital, which is a multi-specialty centre with world-class facilities, providing quality healthcare at affordable costs. For more details on the camp, please contact 04-6030555 or 056-9583264.